News Corp. isn’t beating around the bush with its digital assets. Rotten Tomatoes has been sold off to Flixster. Photobucket went to Ontela. IGN had 20% staff cuts, and MySpace is dealing with co-presidents. Fox Audience Network, the advertising arm for News Corp.’s digital assets has trudged stoically through all the drama. Under President Adam Bain the entity has grown and now powers the ads not only for MySpace and other News Corp. websites, but also a fairly robust set of third party partners. Fox Audience Network is the 8th largest advertising networks according to Comscore, with nearly 150 million U.S. unique visitors a month. And it’s a close race. 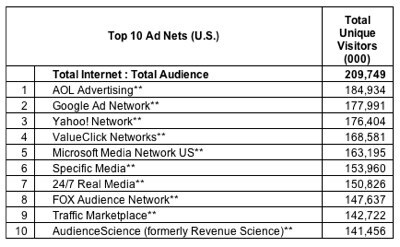 AOL is first with 185 million, and Google is second with 178 million. So what does News Corp. have planned for it’s star Audience Network group? It’s time to sell. A number of private equity groups have been looking at the deal for some time, say multiple sources, and are preparing to submit term sheets now. Our sources are a little vague on expected price. Half of FAN’s revenue is supposedly from third parties, and half from MySpace and other News Corp. properties. We’ve heard about current revenues in the $100 million – $150 million range. One source said the price would be around 1x revenue. We didn’t reach out to News Corp. on this story as they never actually reply, but there will eventually be an announcement on this if the deal goes through.